Are we done re-designing liquid measuring cups yet? It should be simple. The container needs to hold liquid, and you need to be able to read measurements. But there's so much more you can add to a measuring cup that makes it so more useful. Or silly. Or annoying. One of my favorite measuring cups is near the end of its days because the numbers and lines are starting to wear off. Its replacement already has a chip on the rim, which is spectacularly annoying. Another cup that is functionally just fine has a handle that makes it storage-unfriendly because it won't nest nicely. I guess I'm still on a quest for the perfect set of measuring cups. I doubt there is such a thing. 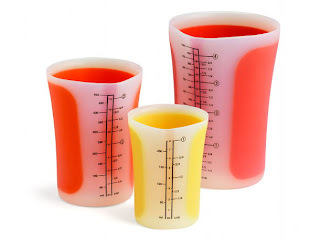 The SleekStor Measuring Beakers ($30/3) from Chef'n can brag that they're innovative. Not the usual cup-shape. The three-piece set - 4-cup, 2-cup, and 1-cup - nests for storage, and each cup has its own lid so you can store things in them. They're heat resistant to 650 degrees, so dishwasher and microwave are no problem. Instead of the usual spout, they've got a "pinch" feature so you kind of squeeze the beaker to make a spout for pouring. It works as well as any other spout, with the slight advantage that you can pinch more for finer drizzling, if that's something you need. The thing I like best about these, though, is that all the measurements are in one place, with lines that make it easy to see that 3 cups is 24 ounces which is pretty close to 700ml. With some of my measuring cups, metric measures are on the opposite side from US measures so you can't see both at once. It's handy to be able to see both for recipes that list both, just to make sure someone's math was correct. The downside to the set, compared to other cups, is the lack of a handle, but because they're tall rather than wide, I can easily hold the 4-cup measure in one hand, so a handle isn't entirely necessary. So far, I like these, with the only question being the durability. How long will it take before the numbers begin to fade? Will that pinch feature eventually cause the cups to crack? Considering the durability of some other silicone kitchen tools I own that I've mercilessly abused, these should have a reasonably long life. These aren't so innovative that I'd suggest throwing out your existing cups to buy them. But if you need an extra set, I'd suggest looking at these. The lids, in particular, make them handy for foods you might measure, mix, and store.